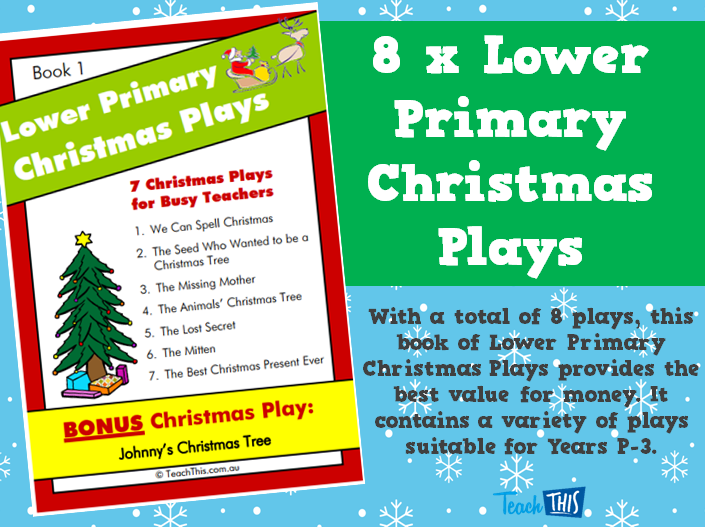 With a total of 8 plays, this book of Lower Primary Christmas Plays provides the best value for money. It contains a variety of plays suitable for Years P-3. Each Christmas Play includes instructions for making props, a suggested practise schedule, the script, any necessary song sheets or poem sheets to hand out to students or use with overhead projectors for audience participation, supplemental activities for students to complete and a note to send home to the parents. The Seed Who Wanted to be a Christmas Tree - In this simple play the teacher acts as narrator, unless there is an older child in the class that can be trusted with reading through the presentation. The parts can be given to multiple children in order to give a place for every member of the class. The Missing Mother - A duckling hatches from its egg as its mother has gone to look for a Christmas tree to decorate her home. The duckling is now looking for its mother amongst other animals. The Animals' Christmas Tree - A mother and her two children do not have a Christmas tree onChristmas Eve. As they prepare for bed, the small animals living outsidetheir home devise a plan to make a Christmas tree. The Lost Secret - Little Claire had a secret. She had hidden the tastiest cookies for Santa. She told her secret to Josh and lets him have one. Josh told the secret to Peter who told it to Annie and she to Sue, Sue to Laurence and in the end Alex also knew. They each taste one cookie as they discover the hidden treasure. Claire is shocked to discover no cookies left for Santa. Something has to be done, and fast. All the guilty children help by replacing the cookies. The Mitten - This play is based on an old Ukrainian folk-story about a young boy who drops his mitten in the snow. The woodland animals quickly discover that the mitten makes a fine place to hide on a cold, winter day. It is a great Christmas play for classes looking at Christmas Around the World. The Best Christmas Present Ever - This is a play for slightly older children capable of memorising a few simple lines and doing some minor acting. It is about a young boy who is planning his letter to Santa and trying to decide what the best Christmas present ever would be. He asks his friends for input and they all have specifications about what would make the ideal gift. Finally he gives up trying to find the perfect gift but his parents give him something that changes his idea of what this present should be. It also includes a BONUS Christmas Play, which is only available in this book. It is not available for separate purchase. Johnny loves the Christmas festivities plus the presents it brings. But most of all, he loves the Christmas tree with its lights and decorations and Santa’s present. The whole year Johnny has been looking for the perfect tree in the forest near their home and has identified one that is all green and leafy. He hopes all year that he will have this tree. When he is disappointed, Santa saves the day.